GORGEOUS REMODEL Overlooking Pool & Fountain! DESIRABLE GATED McCORMICK RANCH VILLA ROYALE COMMUNITY. 1 CAR GARAGE WITH STG. 2nd level condo w/no interior steps. Open concept w/breakfast bar, dining room & dinette. Newer high end cabinets, granite countertops, upgraded smudge-proof stainless appliances, Gas Stove & Fireplace, wood/tile floors (no carpet)! 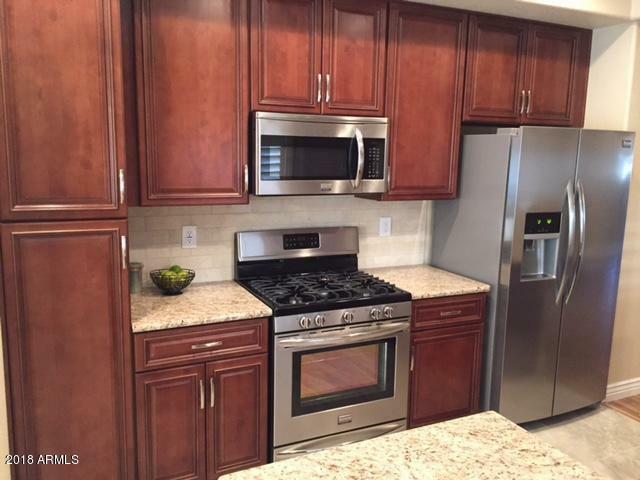 Newer bath fixtures, lighting, hardware, fireplace surround, kitchen sink, faucet & more. Beautiful Wood Shutters & vaulted ceiling add additional character. All Bedrooms with fans/lights. Energy Efficient 2016 AC & Heating system!! Excellent location & Schools. Near the 101 & Centrally located to all Scottsdale has to offer! NO SALES TAX OR ADMIN FEES ADDED TO RENT. Rent also includes water, sewer & trash removal. Additional featuresinclude double paned windows, Soft closed kitchen cabinet doors and drawers w/glazing, Double Sinks in Master Bath Furniture Style Vanity, Classy Closet style in Master, Bedroom 2, Laundry & Garage. Large Base Boards & much more. You will love this beautiful home & community!